A troll who can swim? 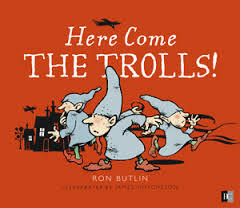 Which send us back into the book again in a ‘wheres wally’ style hunt for the aforementioned trolls. As far as children’s books is concerned, we’re looking at an age range of up to seven, I’d say, all of whom would delight in the musical language, funky wee trolls & bright & cheery colours.